Remember that receptors are like a lock and key on cell outer walls or membranes. It opens the cell membrane enhancing its function. This is a very important activity! The fact that Vitamin D receptors are found on numerous cell walls tells of its importance in maintaining good surveillance by immune cells. This part is also essential in anti-tumor activity. 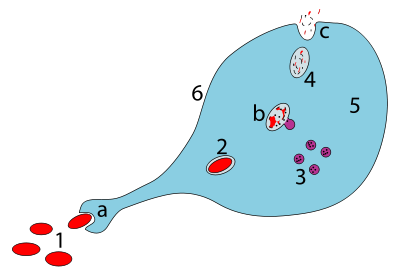 Photo source: Wikipedia – macrophage. Orenda’s All in One Male, All in One Female have 2000 IU of Vitamin D in addition to Immune formula which has the ingredients to modulate immune activity. Orenda Immune is a product that people use for additional cell health. What a fantastic combination to be taking regularly. Dr Pamela Sky Jeanne is a wholistic practitioner and a 40 year veteran in the medical field. She offers exceptional products through her website: www.wellnessaging.info. What is the buzz around Vitamin D? When you view the U-tube link below**, you can hear first hand the excitement that 75% of certain cancers can be prevented with adequate levels of vitamin D. If a drug gave this much efficacy and cure you know it would be broadcast all over the media! Research bears it out that this pro-hormone vitamin D does in fact interact with immune cells to block disease progression. Now that is true cancer prevention. Old naturopathic philosophy and timeless grandmotherly advice was to get lots of sleep and rest, eat nutritious whole foods, get plenty of sunshine with fresh air, and pleasant exercise. This seemingly ho-hum prescription however, is what can cure the body of many diseases. In the medical annals one can find rates of cure for TB reported with the use of sunshine. TB patients were sent to sanitariums and prescribed sunshine and rest each day. Many fully recovered from their disease. The two more common malignancies affecting men and women are breast and colon cancer. Both can have devastating effects and are responsible for 100’s of thousands deaths yearly. The studies have been done and done and done again. There is little question that Vitamin D lowers the risk of cancer. How much Vitamin D should one take? This question depends on individual medical history, skin color, age, current vitamin D levels and place of residence. The deep dark winter is the time many people succumb to all types of illnesses besides colds and flu. Depression, SAD (seasonal affective disorder), pneumonia, sinusitis, bronchitis, pain with chronic illness increases and other immune challenges occur more often when Vitamin D levels are the lowest of the year. In previous health tips I discussed the latest research that shows significant abnormally low levels of Vitamin D in people in all age groups but particularly in very young children and older adults. People living in the northern hemisphere (latitude above 43) are greatly affected; testing is now showing people in sunny climates also have low levels likely due to sun screen use and clothing cover. My strongest advice is get your levels checked. Avoid guessing by checking. There is an easy way now. Go to http://www.zrtlab.com/vitamindcouncil/ and order a low cost test kit and learn what your levels are. It is a simple at home finger stick obtaining a few drops of blood. Be smart, proactive and protect yourself and your family. Your future health relies on your health today. Wellness Aging offers Immune – a product that increases immune activity. Additionally, higher therapeutic levels of Vitamin D are found in the male and female formulas by Orenda. This Vitamin D educational series will continue each week in the interest of winter health. Pamela is a 40 year health care veteran who has practiced in both allopathic and naturopathic realms. She endeavors to provide education and health insights for wellness. With the number of take out “food stores”, it is apparent that we have, without a doubt, become a fast food nation. These tempting “no brainer” food places are found inside grocery stores, convenience stores and free standing popular food spots (burger joints, pizza parlors, fried chicken spots, etc to name just a few). These places can hardly be called restaurants – a place to rest and eat. The popularity of eating food quickly to match our speedy lifestyle poses hazards to our health. A predominant diet of foods highly processed has been and will continue to lead people into increasing disease and early death. Studies are coming out regularly to support this fact. However, the secondary issue with eating on the run is the importance of slowing down to eat, allowing digestion and assimilation of our food intake. Food ingested rapidly creates loss of the initial digestive process that begins with a breakdown of starches in the mouth. Poor digestion and nutrient malabsorption continues along the entire digestive canal. So with intake of the highly processed food even fewer nutrients are getting to cells. Fast eating sets our nervous system into sympathetic action – sort of like high gear; what we really need is our parasympathetic nervous system to help with digestion. The parasympathetic nervous system is responsible for increasing our digestive juices and helps with absorbing nutrients into cells. Here is the key point: Slow down, eat slowly and chew well. Plan harmonious meals at home in a relaxed atmosphere with love and laughter at your table. A recent quote from NY Times Magazine: “|It’s better to pay the grocer than the doctor” from John Forti – learned from his Italian grandmother. One of the major ways to lower blood pressure is weight loss. This can be daunting for many people in America, but action now will prevent debilitating chronic illness such as high blood pressure related diseases: heart failure or heart attack, stroke, kidney disease, blindness etc. Of important discussion is heart failure. It occurs in people later in life often stemming from chronic elevated blood pressure. Imagine if you continuously needed to push a substance through a pipe that was too narrow for the volume (sort of like a sewer line). The pump would fail in time from too much stress and strain; a work load that is too demanding. Now if that pipe got cleared out of the debris and opened wide to allow flow, the strain on the pump would be relieved. Our hearts are very hard working pumps that require efficiency to stay tuned and humming. Weight loss through good nutrition, moderate regular exercise and good water intake are the best starting points. Move your body in an enjoyable ways. Create your rhythm. Dance. Laugh. Find your inner harmony. When we don’t move because we allow stress to immobilize us we are robbed of health and balance. I am passionate about health and committed to helping others create and find their way to great health. It starts with a healthy heart, blood vessels and blood pressure. Aronia berry found in Orenda’s OKI has been well studied and research shows aronia’s power to increase blood vessel dilation. Combination therapy of statin with flavonoids rich extract from chokeberry fruits enhanced reduction in cardiovascular risk markers in patients after myocardial infraction (MI). That is both good for your heart and blood vessels. Drink OKI daily and stay well everyday…. Elevated blood pressure is closely related to the health of the blood vessels. These essential conduits contain the vital nutrients carrying precious blood to all tissues. The heart is the pump that makes it possible for the delivery system to work. So how does a blood vessel stay healthy? It is simple yet complex. Here is a basic explanation: free flowing blood in each blood vessel must reach every part of the human body for essential health and balance. However over time blood vessels can be injured in various ways, but most commonly the delicate lining can succumb to inflammation that then builds up a plaque or a thickness on the inside blood vessel wall. After years of these small inflammatory events and the body’s continuous effort to “repair” the “injury”, the thickness of the blood vessel walls continues to grow. The larger and the smaller blood vessels are affected to varying degrees. The important role of anti-oxidants is key in this repair process. If the repair is not kept up, blood vessels loose their full capacity, narrowing occurs and possible clots form that cause further problems (heart attack, stroke, kidney damage). It is called a “silent killer” because high blood pressure usually gives no symptoms. People feel fine, but the damage is occurring. Protection can be found in foods high in anti-oxidants. We now have through Orenda two delicious ways to get anti-oxidants! Oki and Choki are power house super foods with extremely high anti-oxidants, excellent taste and a great way to help protect your blood vessels. Stay proactive with your health and start today! The news media is filled with flu season concerns that can be confusing and frightening. What if you do not want to receive a flu shot? Are there alternatives? Can you still be safe? The answer is yes! Those groups of people more impacted by flu are children under 5, adults over 65 and those with a significant chronic illness. All of these populations have one common problem: poor immunity or under developed immune function. Knowing how to support immunity is essential to remaining healthy. From a naturopathic principle – the healing power of nature comes from the belief that the body can heal itself. Cells of the body are fertile ground every day for bacteria, fungi and viruses to cause harm, and at every moment active immune cells stay alert for these “invaders”. The H1N1 (Swine Flu) is another variety of flu this year among other flu viruses. It is not more lethal than other viruses. More importantly the power of each person’s immune system is the critical factor for determining whether or not a person will get the flu or experience a mild case. Test Vitamin D levels as you enter the fall/winter months. Ideal levels are 50 – 80ng/ml. See your practitioner or Dr Jeanne for easy testing. Supplement up to 5,000 IU of Vitamin D* each day as the summer sunshine slips away to keep levels in the optimum range. Take Orenda’s Immune 2-4 caps/ day to help increase immune cell surveillance. It is the best immune product in the marketplace. Stop high sugary foods: candy, pop, alcohol, donuts, and sugar loaded ‘health bars’. Sleep at least 8 hours every night and allow yourself to feel rested. Healthy life style habits will improve immunity; daily stressors will lower immunity. Be good and kind to yourself and health will be yours. *QUOTE: “Vitamin D is perhaps the single most powerful nutrient in the known universe for preventing influenza”. ~ Mike Adams, natural health researcher and author.